Mountain Leash could be billed as one of the “strongest dog leash on Earth” without objection. It can also be tagged as a leash imbued with the adventure and romance that is part of the mystic of those who climb mountain ranges all over the world. Now that you don’t get from your everyday length of leather or nylon! When you own a Mountain Leash, you own part of climber’s history. The company collects climber’s rope and recycles it. Everything about this leash honors the environment. For instance, there is no logo, the leash is simply presented with no wasteful excessive wrapping. 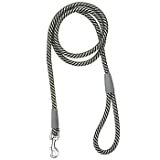 And each leash has high-impact, water resistant hardware for years of use. The rope material is soft to hold in your hand, and the 6’ length is the most versatile for walking, jogging, or running. While you and your dog may not be climbing any mountains anytime soon, this leash should last you a lifetime. A product is only as good as its company, and if longevity can be considered a benchmark of quality, Petmate has been around for 50 years. They created the first airline approved carrier for pets in the business and have other well recognized name brand products under their banner. Petmate Mountain Dog Leash in Black & Gray – The Mountain Leash, it’s a tough leash for tough terrain!The Petmate Mountain Dog Leash is a super strong and durable leash with satin colored nylon rope and high impact, water resistant hardware for years of dependable use. 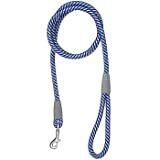 The nylon “rope” leash is intertwined with black and gray colors, most fashionable for almost any dog wanting to get out there and go hiking with their pet parent..
Petmate Mountain Dog Leash in Blue & Gray – The Mountain Leash, it’s a tough leash for tough terrain!The Petmate Mountain Dog Leash is a super strong and durable leash with satin colored nylon rope and high impact, water resistant hardware for years of dependable use. The nylon “rope” leash is intertwined with blue and gray colors, most fashionable for almost any dog wanting to get out there and go hiking with their pet parent..
Petmate Mountain Dog Leash in Red & Gray – From petco.comThe Mountain Leash, it’s a tough leash for tough terrain!The Petmate Mountain Dog Leash is a super strong and durable leash with satin colored nylon rope and high impact, water resistant hardware for years of dependable use. 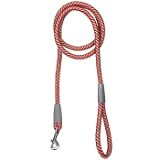 The nylon “rope” leash is intertwined with red and gray colors, most fashionable for almost any dog wanting to get out there and go hiking with their pet parent. Petmate Mountain Dog Leash in Pink & Gray – The Mountain Leash, it’s a tough leash for tough terrain!The Petmate Mountain Dog Leash is a super strong and durable leash with satin colored nylon rope and high impact, water resistant hardware for years of dependable use. The nylon “rope” leash is intertwined with pink and gray colors, most fashionable for almost any dog wanting to get out there and go hiking with their pet parent..
Find more Petmate Mountain Dog Leash products on Amazon!